Residential-sited fuel cells are now becoming an option for consumers, with growing interest and big sales being made primarily outside of the United States. Nearly everyone has been hit by a power outage caused by weather incidents like snow, storms, and hurricanes. These outages can be downright uncomfortable, with no heating, air conditioning, or lighting, and the realization that electric appliances like televisions, ovens, washers and dryers can’t function. It can also be dangerous for persons requiring mobility aids (such elevators between floors) and home-based medical treatments that require electricity. Generating your own power onsite can improve power resiliency and, if clean power generation technologies – such as fuel cells – are used, you can reduce your home’s GHG and other polluting emissions. Residential-sited fuel cells are now becoming an option for consumers, with growing interest and big sales being made primarily outside of the United States. SOFC systems from JX Nippon Oil and Energy. The product specifications vary somewhat from company to company, but are typically sold at rated outputs of 700 or 750 watts (the smallest offering is 200 watts), with a total electric and thermal efficiency ranging from 80 to 95 percent. The companies are constantly improving their ENE-FARM systems in order to reduce cost, and improving efficiency and durability - Panasonic and Tokyo Gas, for example, recently introduced a new ENE-FARM model that is less expensive and offers a 20 percent increase in system durability, to 60,000 hours of operation. 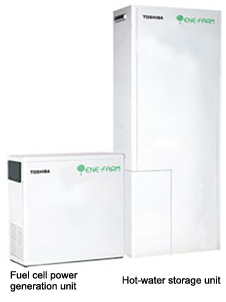 In October 2013, Panasonic and Tokyo Gas announced that they would begin selling a new ENE-FARM fuel cell system developed specifically for condominiums, which face greater siting restrictions than single-family homes. The new ENE-FARM fuel cell for condos is more airtight, permitting the fuel cell, hot water and backup heat source units in the pipe shaft of the condominium. The legs have been strengthened for earthquake resistance, and the wind resistance of the fuel cell has been improved to allow installation on upper floors. The new system will be sold starting in April 2014. In January 2013, the “ene.field” project launched as the largest European demonstration of fuel cell-based micro-CHP. The five-year demonstration, which is co-funded by the European Commission’s Fuel Cells and Hydrogen Joint Undertaking (FCH-JU), will deploy up to 1,000 residential fuel cell installations across Austria, Belgium, Denmark, France, Germany, Luxembourg, Ireland, Italy, the Netherlands, Slovenia, Spain and United Kingdom. The project includes over 30 utilities, housing providers and municipalities to bring the fuel cell products to market and to explore different business models for micro-CHP deployment. Based on the expected electricity generation mix in 2020, a typical family home will save between 21-40 percent on GHG emissions by using a CHP fuel cell, compared to a condensing boiler. Like the ENE-FARM program in Japan, the ene.field program is supported by the government, co-funded by the partners and the European Commission’s Fuel Cells and Hydrogen Joint Undertaking Programme (FCH JU) and has total costs of €53 million (appr. $71.46 million dollars) with €26 million ($35.83 million) in European funding from the EU’s Seventh Framework Programme. There is also the Callux program in Germany, set up by the German Ministry for Transport, Construction and Urban Development, and nine partners from industry, which will deploy more than 800 residential fuel cell units in the next year, making it the biggest practical fuel cell test in Germany (and Europe). This project is also financed by both industry (€39 million ($53.75 million) and ministry (€36 million ($49.61 million). Several different industry partners are involved both in the Callux project and in the ene.field project, combining their experiences. The initiator of the Callux program regularly makes surveys about the satisfaction (this contains fault liability and maintenance quality) of the user of these units. A recent survey (8/27/2013) show that most of the users are satisfied with three of four even very satisfied. Nine out of 10 would recommend residential fuel cells to friends. The survey also shows that the users definitely like the new technology, and feel it is part of an important contribution to the energy transition in Germany. In Denmark, the Danish Micro Combined Heat and Power project will spend €22.7 million ($31.28 million) between 2010 and 2014 to deploying CHP fuel cells. There is also the SOFT-PACT project that will spend $13.89 million dollars between 2011 and 2014, deploying fuel cells in the United Kingdom and in Germany. And there are several smaller projects in the United Kingdom as well, such as AIMC4 project with a total fund of £6.4 million ($10.32 million). Additionally, several Japanese companies want to expand their products into Germany. In 2012, JX Nippon Oil & Energy announced that it had partnered with the German Center for Fuel Cell Technology (ZBT) in hopes of bringing a fuel cell product to the German market, examining the compatibility of the company’s SOFC system with the natural gas used in German homes. In addition, Panasonic teamed up with German heating manufacturer Viessmann to develop a fuel cell system for Germany, with sales possibly starting in 2014. Overview: The Ene.field project will deploy and monitor approx. 1000 fuel cells in 12 European countries. ene.field will demonstrate the environmental and economic imperative of micro FC-CHP, and lay the foundations for market exploitation. Objectives: A real world learning - demonstration of market potential, segmentation, cost and environmental benefits of fuel cell micro-CHP (m-CHP) and a more mature supply chain, readied for deployment of micro fuel cell – combined heat and power in 12 Member States. Timeframe: 5 years of duration, between 2012 and 2017, first units were deployed in September 2013. Funding: Costs of 53 million Euros (appr. $71.46 million dollars) with €26 million in European funding from the EU’s Seventh Framework Programme. The ene.field project is cofunded by the partners and the European Commission’s Fuel Cells and Hydrogen Joint Undertaking Programme (FCH JU). Technology: fuel cell mCHP, both high and low temperature PEM and intermediate and high temperature SOFC. Needs connection to the grid. Status: Running, first units deployed in Germany in September 2013. 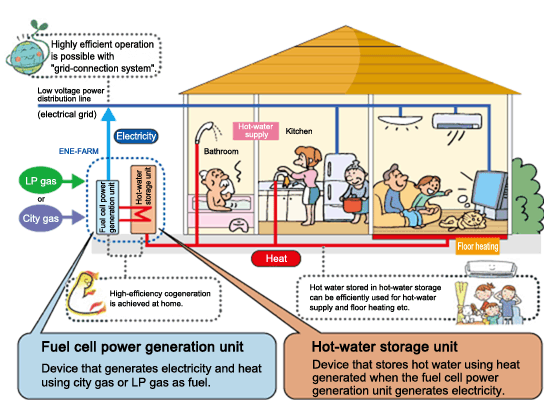 Overview: Japanese customers are becoming increasingly attracted to the idea of clean electricity and hot water provision independent from the grid, especially after the Fukushima crisis. The government massively subsidies deployment of residential fuel cells in Japan. Objectives: Fuel cells should become cost-competitive on their own, establish a supply chain, lowering the price of fuel cells through mass-production. Timeframe: Project began in the 1990s with research, demonstration phase between 2003 and 2005, large-scale demonstration from 2005 until 2009, commercial start in 2009, no end date. Price: New models cost about $21,374 Dollars. Funding: Japanese government subsidizes the purchase - in 2009 it contributes $14,987 to the purchase price, $4,817 in 2012, goal is to stop the subsidies in 2015. In 2011 Japanese government provided $112.7 million dollars. Technology: Currently 80% PEM and 20% SOFC in mCHPs. Modern fuel cells are operating in a range between 200 W and 750 W, older ones between 300 W and 1 kW. New Generation of fuel cells were introduced in 2013 that are smaller, cheaper (by using less parts). Needs connection to the grid. Status: Running, at the end of 2012 more than 34.000 ENE-FARM units were deployed. Goal is to deploy more 50.000 units by 2015. U.S. fuel cell manufacturer, ClearEdge Power, has been selling 5-kW residential-scale CHP fuel cell systems for several years, primarily in the California market where state subsidies help to offset the cost of the system. Targeted market sectors include data centers, restaurants, retail outlets, hotels, fitness centers, multi-family residential buildings, supermarkets and other facilities with continuous baseload power and thermal energy requirements. The units are powered by natural gas and can operate independent of, or in parallel with, the electric grid. Architecture and development firm, Becker + Becker, has installed fuel cells in several East Coast multi-family residential buildings that they have rehabbed. In 2010, the firm installed two 400-kW fuel cells from ClearEdge Power (formerly UTC Power), one at an historic apartment building on Roosevelt Island in New York City (The Octagon), and the other at a residential skyscraper building in New Haven, Connecticut (360 State Street). At the 360 State Street building, 65 percent of the fuel cell-generated electricity is used to provide power to common and commercial areas. The remainder of the power (excess generation) goes back to the power grid, with reimbursement. In the winter months, 100 percent of the fuel cell’s waste heat is used for domestic hot water heating, and space heating for 500 apartments, as well as common and commercial areas; in summer months, 60 percent of the waste heat is used for domestic hot water and swimming pool heating. Recent legislation in Connecticut permits the sub-metering of electricity from renewable sources to residential tenants, and so Becker + Becker are making modifications to the system to allow sale of fuel cell energy to the residents in the coming year. On average, the fuel cell saves the project $230,000 in utility costs compared to a traditionally powered building through a combination of electricity savings, heating and hot water savings, and renewable energy credit sales. In 2014, Becker + Becker intend to install another ClearEdge Power 400 kW fuel cell at a mixed-use property in Hartford, Connecticut. At the Octagon, 100 percent of electricity generated by the fuel cell provides the primary source of power for 500 apartments and common areas, with supplemental power provided by the utility grid at peak hours. Seventy percent of the fuel cell’s waste heat is used for domestic hot water and space heating. The power is sub-metered to tenants, who are charged utility rates for their electricity use. On average, the fuel cell saves the project $440,000 through electricity savings and sales, heating and hot water savings.